MS Switches can forward IGMP traffic, but will run IGMP snooping by default. This prevents the switch from sending multicast traffic to hosts who are not yet joined with the proper multicast group. IGMP Snooping can be disabled under the Switch >Switch Settings page in Dashboard. Simply enabling the multicast protocol on one VLAN will work if Airtame and PC are on the same VLAN but in the case of different VLANs, the multicast traffic will need to cross VLANs. Therefore, some additional multicast routing configurations on the Network side is needed from the network administrator. Certain Cisco Meraki switches support multicast routing; specifically, Protocol Independent Multicast - Sparse Mode (PIM-SM). 1. Navigate to Switch > Configure > Routing and DHCP. 2. Select the interfaces that require multicast routing. 3. 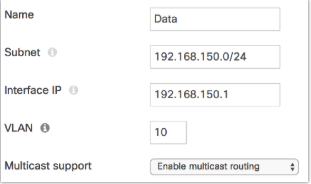 Under multicast support, select Enable multicast routing. 5. Once saved, navigate back to Switch > Configure > Routing and DHCP. The Multicast Routing section will now be available. 6. Click Add a rendezvous point . 7. Enter the rendezvous point (RP) and multicast group information. This can be a multicast routing enabled interface or custom IP for a third-party RP. ⚠️To read more about Multicast support on Meraki click below.